The Hudson Theatre originally opened on October 19, 1903, one week before the New Amsterdam Theatre, with a production of Cousin Kate starring Ethel Barrymore. 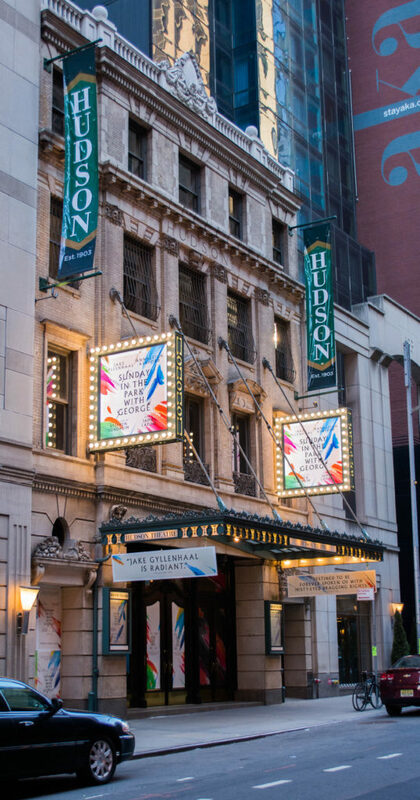 Built by Henry B. Harris, a famous Broadway producer of that period, the Hudson is both New York City’s oldest operating Broadway theater and the newest Broadway house to re-open. Among the stars that have graced the Hudson’s stage are Laurence Olivier, Douglas Fairbanks, Louis Armstrong, George M. Cohen, Helen Hayes, Lena Horne, and many more. The first nationwide broadcast of “The Tonight Show” starring Steve Allen originated from the Hudson in 1956. Following an almost 50 year hiatus as a legitimate playhouse, Ambassador Theatre Group in partnership with Millennium & Copthorne Hotels plc restored the landmark venue to its former glory. The Hudson Theatre’s grand re-opening night was celebrated on February 23, 2017, with the highly acclaimed revival of Stephen Sondheim and James Lapine’s Sunday in the Park with George, starring Jake Gyllenhaal and Annaleigh Ashford.